To foster and encourage higher learning, KBD has awarded $51,500 in education bursaries to local students since 2006. 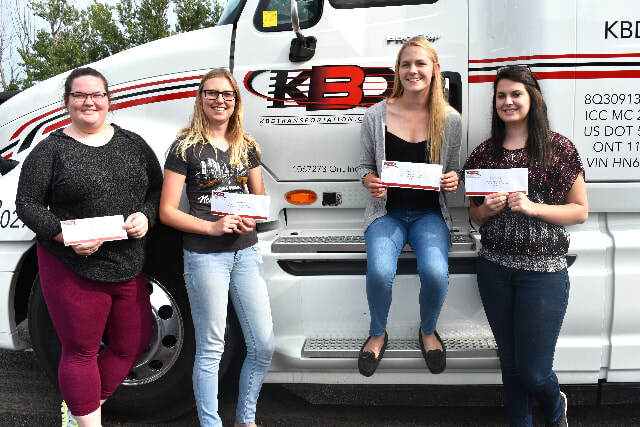 If you're a KBD student or employee, or child or grandchild of a current KBD employee, you may be eligible for an annual education bursary of up to $1,000! If you meet the criteria below, the answer is yes! You can provide proof that you're registered to attend an accredited post-secondary institute for Fall/Winter studies in the upcoming semester. ﻿Education Bursary Presentation - TBA. If there are any questions or concerns please direct them to Kim. Note that successful applicants, once notified, must make themselves available to attend the Awards Ceremony in order to receive their bursary. Grants will be allocated at the discretion of the Board of Directors. Amounts may vary from year to year depending on quality and quantity of applicants. Congratulations to last year's recipients who received a combined total of $3500 in bursaries to continue their post-secondary education! Each recipient was asked to give suggestions on how we could improve different portions of our website. Recipients included, from left to right, Hanna McLean-Duncan (Granddaughter to Mechanic, Pat McLean), Kaitlyn Geurkink (Administrative & Office Employee), Lindsay Venema (Significant other - Mechanic, Toby Mullin), Taylor Van Allen (Daughter of Company Driver, Mike Van Allen). Hanna returned to St. Lawrence College for her 2nd year in a Bachelor of Science in Nursing! Kaitlyn is attending a program with Nipissing University through Algonquin College, first semester working towards her Bachelor of Business Administration! Lindsay returned to Nipissing University for her 4th year in Bachelor of Science in Nursing! And Taylor attended Algonquin College for her 1st year in Pre-Health Science!